This page Nonsense is part of the communication series. This page Nonsense is part of the meaning series. 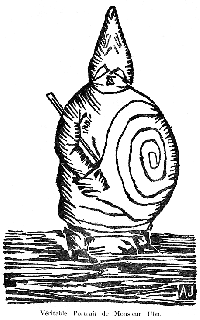 Illustration: True Portrait of Monsieur Ubu (1896), a woodcut frontispiece for Ubu Roi representing Ubu, a fictional character from Jarry's eponymous play. Nonsense is a communication, via speech, writing, or any other symbolic system, that lacks any coherent meaning. Sometimes in ordinary usage, nonsense is synonymous with absurdity or the ridiculous. 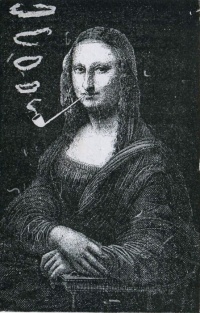 Many poets, novelists and songwriters have used nonsense in their works, often creating entire works using it for reasons ranging from pure comic amusement or satire, to illustrating a point about language or reasoning. In the philosophy of language and philosophy of science, nonsense is distinguished from sense or meaningfulness, and attempts have been made to come up with a coherent and consistent method of distinguishing sense from nonsense. It is also an important field of study in cryptography regarding separating a signal from noise. The phrase "Colorless green ideas sleep furiously" was coined by Noam Chomsky as an example of nonsense. The individual words make sense and are arranged according to proper grammatical rules, yet the result is nonsense. The inspiration for this attempt at creating verbal nonsense came from the idea of contradiction (for a start, how can a green idea be colorless?) and seemingly irrelevant and/or incompatible characteristics, which conspire to make the phrase meaningless. The phrase "the square root of Tuesday" operates on the latter principle. This principle is behind the inscrutability of the kōan "What is the sound of one hand clapping? ", where one hand would presumably be insufficient for clapping without the intervention of another. James Joyce’s final novel Finnegans Wake also uses nonsense: full of portmanteau and strong words, it appears to be pregnant with multiple layers of meaning, but in many passages it is difficult to say whether any one human’s interpretation of a text could be the intended or unintended one. Jabberwocky, a poem (of nonsense verse) found in Through the Looking-Glass, and What Alice Found There by Lewis Carroll (1871), is a nonsense poem written in the English language. The word jabberwocky is also occasionally used as a synonym of nonsense. 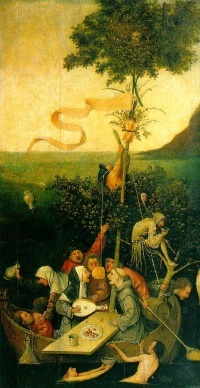 Nonsense verse is the verse form of literary nonsense, a genre that can manifest in many other ways. Its best-known exponent is Edward Lear, author of The Owl and the Pussycat and hundreds of limericks. Nonsense verse is part of a long line of tradition predating Lear: the nursery rhyme Hey Diddle Diddle could also be termed a nonsense verse. There are also some works which appear to be nonsense verse, but actually are not, such as the popular 1940s song Mairzy Doats. Lewis Carroll, seeking a nonsense riddle, once posed the question How is a raven like a writing desk?. Someone answered him, Because Poe wrote on both. However, there are other possible answers (e.g. both have inky quills). Lines of nonsense frequently figure in the refrains of folksongs, where nonsense riddles and knock-knock jokes are often encountered. In the philosophy of language and the philosophy of science, nonsense refers to a lack of sense or meaning. Different technical definitions of meaning delineate sense from nonsense. In Ludwig Wittgenstein's writings, the word "nonsense" carries a special technical meaning which differs significantly from the normal use of the word. In this sense, "nonsense" does not refer to meaningless gibberish, but rather to the lack of sense in the context of sense and reference. In this context, logical tautologies, and purely mathematical propositions may be regarded as "nonsense". For example, "1+1=2" is a nonsensical proposition. Wittgenstein wrote in Tractatus Logico-Philosophicus that some of the propositions contained in his own book should be regarded as nonsense. Used in this way, "nonsense" does not necessarily carry negative connotations. The problem of distinguishing sense from nonsense is important in cryptography and other intelligence fields. For example, they need to distinguish signal from noise. Cryptanalysts have devised algorithms to determine whether a given text is in fact nonsense or not. These algorithms typically analyze the presence of repetitions and redundancy in a text; in meaningful texts, certain frequently used words—for example, the, is and and in a text in the English language—will recur. A random scattering of letters, punctuation marks and spaces will not exhibit these regularities. Zipf's law attempts to state this analysis mathematically. By contrast, cryptographers typically seek to make their cipher texts resemble random distributions, to avoid telltale repetitions and patterns which may give an opening for cryptanalysis. It is harder for cryptographers to deal with the presence or absence of meaning in a text in which the level of redundancy and repetition is higher than found in natural languages (for example, in the mysterious text of the Voynich manuscript). Scientists have attempted to teach machines to produce nonsense. The Markov chain technique is one method which has been used to generate texts by algorithm and randomizing techniques that seem meaningful. Another method is sometimes called the Mad Libs method: it involves the creation of templates for various sentence structures, and filling in the blanks with noun phrases or verb phrases; these phrase-generation procedures can be looped to add recursion, giving the output the appearance of greater complexity and sophistication. Racter was a computer program which generated nonsense texts by this method; however, Racter’s book, The Policeman’s Beard is Half Constructed, proved to have been the product of heavy human editing of the program's output. Unless indicated otherwise, the text in this article is either based on Wikipedia article "Nonsense" or another language Wikipedia page thereof used under the terms of the GNU Free Documentation License; or on original research by Jahsonic and friends. See Art and Popular Culture's copyright notice. This page was last modified 13:30, 17 June 2014. This page has been accessed 7,228 times.